After implementing carefully researched lifestyle changes, I was able to see a tremendous improvement in my health. I decided to summarize my research and improvements in my book Hashimoto’s The Root Cause in 2013. When I initially published the book, I was hopeful that one day a group of researchers would take the information I collected and carry out a large-scale clinical trial to test the interventions. Unfortunately, these types of clinical trials can be very expensive, and there isn’t a financial incentive for most companies to do this kind of research if they can’t collect a return on their investment. Then I realized, that we, the thyroid community have the power to create our research!! 69% of you reported that you had a lot of stress in your life before you started feeling unwell. Getting enough sleep, spending time with loved ones, being in nature, walking, massage, reading, sitting on a beach and being warm were some of the activities that made most people with Hashimoto’s feel better, while lack of sleep, being stressed out, being around negative people, fighting with loved ones and a lack of sunshine and cold weather made most people with Hashimoto’s feel worse. Please don’t under-estimate the importance of stress reduction in your healing journey. I want you to remember that stress is not just caused by external factors, but can also be self-induced due to our thought patterns like negative self-talk or perfectionism. I recommend taking a nice vacation or “staycation” where you take a few days to focus on relaxing and self-care. 68%, 33% and 28% of you were found to have low levels of Vitamin D, low levels of B12 and low levels of ferritin, respectively. Low levels of these nutrients can be a huge contributor to thyroid fatigue. Low ferritin levels are an indicator of anemia and can contribute to hair loss as well. If you have not had these important tests, please talk to your doctor about testing for them. I’ve written about each of these nutrient deficiencies on my blog: –> Links to articles –> [Thyroid and Vitamin D] [Thyroid and B12] [Thyroid and Ferritin], and cover them in my chapter on Nutrient Deficiencies [Download the Nutrient Deficiencies chapter for free HERE]. Taking supplements can help restore your nutrient levels and help overcome fatigue. When asked about the benefits of various interventions, 67%, 88%, 82%, reported that vitamin D3 supplement, B12 supplement, and iron/ferritin supplement improved their fatigue, respectively. 76% of you reported that you thought you were gluten sensitive (16% of you were not sure, the rest did not believe that you were). Most people that reacted to gluten felt the reaction in their gut (symptoms of constipation, diarrhea, cramping, bloating, nausea, gas, acid reflux, burning or burping) and in the brain related symptoms like headaches, dizziness, brain fog, anxiety, depression, fatigue, and insomnia. 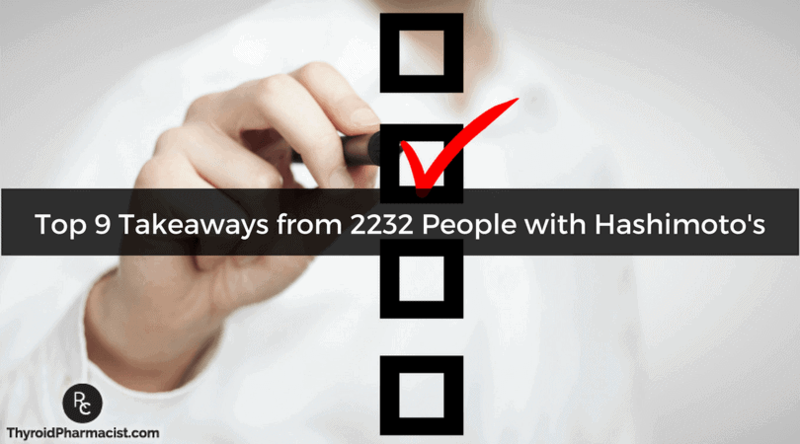 Overall, 88% of people who attempted to go gluten-free felt better!! Notably, only 3.5% of you were diagnosed with celiac disease. Thus this confirms what we’ve been saying all along, you do not have to have celiac disease to benefit from a gluten-free diet! If you are still on the fence about going gluten free, I encourage you to try it! In addition to the gluten-free diet, the other most helpful dietary interventions were going on a sugar free diet and the Paleo diet (81% of those who tried these diets felt better), grain-free diet (81% felt better), dairy free diet (79% felt better), autoimmune Paleo diet (75% felt better) and the low glycemic index diet (76% felt better). Incorporating healing foods also made people feel better. Homemade broth helped 70% of those that tried it; Green smoothies helped 69%, and fermented foods helped 57%. The most helpful nutritional interventions were taking a B12 supplement (76%), D3 supplement (74%), digestive enzymes (73%), ferritin/iron supplement (63%), Omega-3 Fatty acid supplement (65%), selenium 200 mcg supplement (63%), Betaine with Pepsin supplement (59%), curcumin supplement (56%), zinc 30 mg supplement (52%) and L-glutamine supplement (51%). (The numbers in the parentheses represent the % of people who reported “feeling better” after trying these supplements). I’ve written about all of these supplements in my book, Hashimoto’s: The Root Cause, and the majority are covered in my nutrient depletions chapter [download the nutrient depletions chapter for free]. Feeling tired, blue and in pain? Have a spa day! Sauna therapy helped an overall 57% of those who tried it to feel better; the biggest benefits were seen in mood, energy, skin and reducing pain levels. Massage helped improve mood for 80% of people, reduced pain for 62% and improved energy levels in 45% of people! Going to the spa may get very expensive, but you can look for ways to make it more affordable. For example, some gyms may have saunas in them that you may be able to use with a membership or a daily pass, and massage companies often have discounts on their websites. My husband and I once found a local massage school that offered deeply discounted massages. When all else fails, you can do a hot Epson salt bath at home, and get your partner to give you a massage. Sixty nine percent of respondents feel optimal with a TSH under 1 μIU/mL, and 57% felt good with the TSH between 1 and 2 μIU/mL !! While a TSH as high as 4 μIU/mL may be considered to be “within normal limits” I felt like a sloth and was losing a ton of hair when my TSH was at that level. You can read my article about TSH in this article for more information. 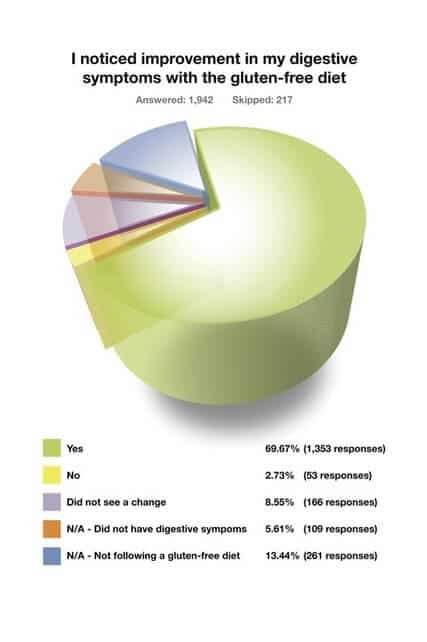 While only 38% of those that tried it reported feeling better, the ones that saw benefit had some spectacular results. 48% were able to reduce thyroid antibodies, 61% saw an improvement in mood, 66% were able to have more energy, and 40% saw a reduction in pain. Thirty six percent of people felt that probiotics helped them normalize their weight. I’ve written about weight, Hashimoto’s and probiotics. “I was diagnosed with underactive thyroid and had radiation in 1969 as a child, Synthroid treatment for years, rheumatoid arthritis diagnosed in 2012 along with Sjogren’s syndrome, leaky gut, and chronic sinus infections. I was a weak, sick, nearly bedridden woman on a ton of medicine. I was getting sicker and being prescribed more dangerous and expensive medications with no real end in sight for pain or healing. I know that Hashimoto’s can make us feel very much alone, especially when no one else we know personally has the condition. Even when others we know have Hashimoto’s, the condition can manifest with different levels of severity in different individuals, making us wonder why we feel so much worse than others. I’ve been there. I want you to know that you’re not alone and that you can get better. I’m here for you, and together, we can overcome Hashimoto’s… it may take some work on both of our ends. I’ve been working on some exciting stuff behind the scenes to support you guys over the last six months and will be trickling out information to a subset of you over the coming weeks and months so watch your inbox for announcements from me. …and some innovative and exciting surprises !! I hope this survey of interventions encourages you to take charge of your health and to find a deeper level of healing. I recommend dedicating 1 hour each day to self-care. You should focus on things that relax you and make you feel better, preparing nourishing foods, and staying on top of your supplements and labs. After all, what gets measured gets managed! Give yourself the same care as you would to a loved one, child or pet who needed you. I hope that you found this information helpful in your healing journey! P.S. Be sure to sign up to my email list to get a free book chapter, recipes, Thyroid Diet start guide and notifications about upcoming events and my weekly newsletter. Wow – thanks so much for all your work. There is some really interesting data there. I’m half way through your book, and making lots of changes. You’re making a real difference to people’s lives so thanks! wow, I knew what seemed to work for me but, to see the results that I saw were effective across the board is amazing! And, what a suprise to see my story shared!! It took a lot of work and still does but, I’m worth it and so are all of you. This journey has had a lot of lonely frustrated and helpless feeling days, please keep on fighting, you will see the benifit but, it can take some time. I just got officially diagnosed with Hashimotos today. T P Antibody was 666.9. Now to be on Levothyroxine and Liothyronine. Gluten Free too. How long before I notice a change? HI, A person may need Zinc/Se/enough iron/probiotic to convert T4 to T4. LDN is awesome..helps block hidden gluten. No gluten/dairy/soy/sugar/GMO…vitamins/good oils, LDN, detoxing help me. Far Infrared Sauna may help detox heavy metals and more. Best wishes. Shasha- Not everyone will need every single supplement! In fact, I believe that most nutrients should come from the diet, this is why I always list food sources for most of the nutrients, vitamins, minerals and probiotics that are depleted in Hashimoto’s in the book and on the blog. However, some may require/prefer supplements and the supplements on the website are a resource for those that do. I recommend getting tested for deficiencies to determine your need for a supplement as instructed in the book and blog. I also don’t recommend starting multiple supplements all at once. I recommend starting one at a time and then adding another a week or so later once it has been confirmed that the first supplement is not causing any harm. I do have a full supplements chapter in my book. Have you checked it out? Not everyone should be taking every supplement and the book will help uncover your root cause. This will help you figure out your supplementation. I just ordered your book and can’t wait to dive right into it. Thanks for all you do, you are helping so many people! You are such an incredible, giving person, changing lives for the better and expecting little in return. Thank you!!! Jennifer- Awe thank you so much for your kind words and your support! Most people will see a dramatic reduction in gut symptoms, brain symptoms, skin breakouts and pain by eliminating the foods they are sensitive to. Some will also see a significant reduction in thyroid antibodies! 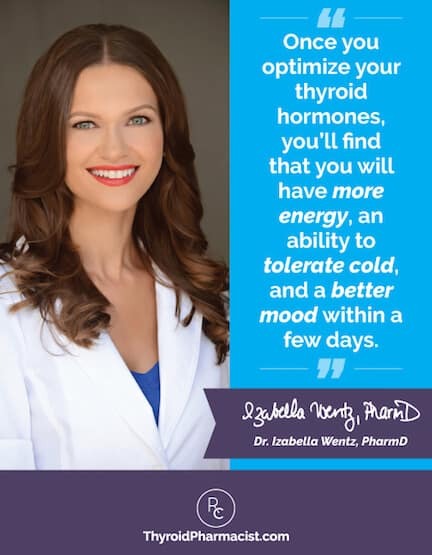 An additional subset of people, will actually be able to get their Hashimoto’s into complete remission just by getting off the foods they react to, normalizing their thyroid antibodies, and some even normalizing their thyroid function! Here are a couple of articles you may find helpful. I did try going Gluten Free. I did it for almost 2 months and honestly didn’t feel any change. I do take Vit B12 and Vit D3 every day. I have good days and bad. My ENT told me to go ahead and stop the gluten free diet since I should have noticed results after a month. I have good days and bad. I have also been told that if you suffer from allergies that the histamine can block the protiens or whatever it is the thyroid produces. Taking Allegra has helped some. I am also about 3 week in to taking Tirosint instead of synthroid. It is a gel cap and is supposed to absorb into the thyroid better. The stress thing has me intrigued because I notice I am more tired suring the week when I work compared to the weekends. Hi, Allergies can be due to leaky gut due to gluten. Vit C may lower histamine. Zinc/Se/enough iron/probiotic may help convert T4 to T3. Gluten free: There is hidden gluten in most food with a label/nuts not in the shell/meat basting/some spices/restaurants/lotions/make up and certified gluten free may have 20ppm of gluten..too much. Gluten free saved my life. Hair tests show good minerals absorbed and heavy metals. Low minerals show gluten hurting intestinal absorption. You can see if you are not absorbing by my finger nails if ridges. If white spots..then low in zinc. LDN is awesome and $1 a day. Good/bad days may depend on what you eat. T4 to T3 needs zinc/Se/enough iron/probiotic to make the conversion. What I do: No gluten/dairy/soy/sugar/GMO and vitamins/good oils, LDN and detoxing help me. Vit D3 5000IU, zinc 50mg if detoxing, fish oil 2000mg, 20000mg of evening primrose oil. 2000 mg of lecithin, Phosphatidylserine/DMAE or krill oil, Coenzyme Q10, Rhodiola, Mg citrate 400mg, Vit C, 5000mcg of biotin, Nature’s Plus- Source of life multiple, HCl and enzymes with meals, dairy free probiotic, Vit B12 methylcobalamin shot/spray/under the tongue kind/intrinsic factor kind, MTHF folate, coenyzme Q10, rhodiola, may help brain/body/thyroid/ and more health issues. Gluten is wheat/barley/rye..oats may act like gluten with avenin. GMO corn/soy/canola oil may hurt. Amour thyroid maybe needed since gluten may made antibodies to the thyroid. Sunlight (helps the immune system and helps to heal the gut lining),exercise, organic food, good water..not tap water, cooking by scratch pure food….. no food in a box/bag/premade/label/restaurant which may help avoid hidden gluten. Certified gluten free food may have 20ppm of gluten…too much. Nuts not sold in the shell/meat basting/some spices may have hidden gluten and lotion/make up etc. One restaurant cooks special for me…rice/veg/tea/extra mushrooms (no meat since the woks may have MSG/gluten in them). EDTA/DMPS IV chelations from an Alternative doctor, 600mg of cilantro, zeolites, organic sulfur, Now brand- Detox support, Far Infrared Sauna and more may help detox. Hair tests show good minerals and heavy metals. Heavy metals can block thyroid and other chemical reactions in the body/brain. LDN may help block hidden gluten/heal the gut lining and help the immune system, but the Celiac diet is still needed. 100% no gluten..no hidden or microscopic gluten may help. Cutting back on gluten or cheating by eating gluten hurts the immune system. It may take 1 1/2 months to heal the gut lining after getting hidden gluten. Best wishes. Thank you for all the encouragement you are providing from your research. I was recently diagnosed with Hashimoto’s and feel so blessed to have this information early on in my journey. I was wondering if you had an opinion on whether taking synthroid is more or less beneficial than taking Armour for Hashimotos? Lisa- There are quite a few options for thyroid medications. In my experience, what works for one person may not work for another. If your doctor will not prescribe the medication you are looking for, ask your local pharmacist for doctors in your area who prescribe the medication you are looking to try. Have you read these articles? Hi, Amour thyroid has some T3 and Calcitonin. Synthroid is only T4..may not convert to T3. Zn/Se/enough iron/strong probiotic may help convert T4 to T3 for thyroid. Taking body temperature may help a person know what is happening. See my other comments. Best wishes. God bless you Dr. Wentz. It’s because of you & your book and your summits that I was given hope when I was diagnosed with Hashimoto’s in February 2014. Since then I’ve been able to heal my body w/ food, vitamins, minerals & herbs. Thank you for all of your hard work & dedication. You are literally saving lives…you helped me save mine & I’ll be forever grateful! You say you’re looking for someone to help with statistical analysis for your survey — I work as a statistical analyst and I would love to help if I can! I was just told yesterday that I have hoshimotos. I was diagnosed with Graves’ disease in 1993. I had RAI ten years later and I am still suffering now with underactive. They say my levels are high and every test gets worse. I was taking levothyroxine but it made me worse with heart beating and anxiety. Just put me on very low dose, 4 x a day and meds for the heart. Praying this works was up most of the night with pain in stomach and I am very tired and weak and body aches especially the legs and out of breath. I have to work a lot of hours to make it financially so don’t have time to be sick. I’m gonna try your book and hope it works. I do believe in positivity. When I’m negative or stressed I feel worse! Thank you for all your hard work and website! At least now I’m not alone! Hi, Stress uses up B vitamins and zinc. The thyroid needs these to work right. Stomach may hurt due to gluten. Gluten/Hidden gluten can make antibodies to the thyroid. Amour thyroid may help along with Synthroid. Synthroid alone may not convert from T4 to T3 without enough zinc/Se/enough iron/probiotic. Amour thyroid also have calcitonin in it. Synthroid (Levothyroxine is generic) without the zinc etc may not work. The heart needs energy from the thyroid. Heart medicine may not be needed once the right dose/kind of thyroid medicine is used and a person gets Celiac help which may help more minerals absorb in intestines. LDN may help block hidden gluten. Pains maybe due to low thyroid and Mg. Mg helps potassium absorb which may help the water hydration in the body. See my other comments…what I do for Celiac. Best wishes. Thank you so much for you hard work and dedication to helping others without wanting anything in return. That’s an amazing quality. Love this article. What role does methylation deficiency play in hashimoto’s? Can fixing the methylation deficiency correct the hypothyroidism? Hi, I need MTHF folate and Methylcobalamin shot and coenyzmated B vitamins. Celiac people may need this kind of help. Celiac…gluten may make antibodies to the thyroid. Once the thyroid is hurt it may not heal. The person may need thyroid medicine for life, but eating no gluten/dairy/soy/sugar/GMO and taking vitamins/good oils, LDN, detoxing may help. See my other comments. Best wishes. I can assist with stats. I’m a director of research and have been in this field for 16 years. I have a personal investment in trying to help others with this diagnosis as I have suffered from it for the last 9 years. It would be my pleasure to assist you! I call it a miracle for finding you on Facebook. It’s my second week on finding out I have Hashimoto’s Disease from a functional medicine doctor. It’s been a “roller coaster ride” these few years of unexplained symptoms. Been to many doctors and many blood test to only be told it’s depression or anxiety or I was crazy! I knew deep down it was something else. Thank God I found you. I have hope now. Hi, Depression/anxiety/obsessing/no sleep/panic/suicidal thoughts can be due to low oxygen in the cells of the brain due to Celiac. Celiac…gluten can make antibodies to the thyroid…lowers oxygen burning in cells. No gluten may help intestines heal and absorb more nutrients…rebuild cells to work better to burn oxygen. See my other comments. Best wishes. Hi, Anxiety/depression/obsessing/panic/no sleep/suicidal thoughts can be due to low oxygen in the brain due to low thyroid which can be due to eating gluten/dairy/soy/sugar/GMO. See my above long comment about Celiac. Best wishes. I have a question I keep posting everywhere. Is there any research that has been done after TT and still untreated Hashimotos? It’s great prevention but what if its too late? Then what? I know myself and others continued to have other organs affected like I no longer have a gallbladder like others and still others have liver kidneys and other issues. We need more research on this please! Rosalind- Most thyroid conditions result from the immune system attacking the thyroid because the immune system is out of balance. Even when the thyroid is taken out surgically, is ‘dead’, or treated with radioactive iodine the autoimmunity still persists in most cases. Many people will have their thyroids removed, and will develop new autoimmune disorders such as Lupus, Rheumatoid arthritis, etc. The immune system just finds a different target. We need to re-balance the immune system to prevent this (sometimes the autoimmunity can be reversed as well). The gut determines your immune system. With the exception of discussing proper thyroid medication dosing, the majority of my website and my book focuses on balancing the immune system. The info I present is based on my own research and journey for overcoming my autoimmune thyroid condition. Hi, Celiac…gluten may hurt all glands…thyroid/gall bladder/pancreas/pituitary etc. Gluten may hurt kidneys. A Zyto scan said my thyroid was 1/2 functioning. Any hidden microscopic gluten may make more antibodies to the thyroid. Just taking thyroid medicine doesn’t stop the Celiac, but only replaces what is not working. Some people say they rebuilt their thyroid, but I have not. My thyroid is working enough to open my eye/sit in bed, but not walk. My legs swelled 3-4X their size and they gave me diuretics instead of thyroid medicine in the hospital. My thyroid stopped 30 years ago and they said I don’t need thyroid medicine. I had all the symptoms of low thyroid…constipation/low body temperature/high D dimer test/thick blood/clots that happen when thyroid is low due to a clotting disorder. Taurine may dissolve gall stones. Liver…milk thistle/alpha lipoic acid, Now brand- Detox support, Vit C, glutathione, Vit E, 2000mg of lecithin, fish oil 2000mg and more may help. TheDr.com/Peter Osborne/Mercola articles on Face book/Youtube.com….. Dangerous Grains by Braly/Wheat Belly book/Grain Brain book and more may help. What I do for Celiac..short version: No gluten/dairy/soy/sugar/GMO and vitamins/good oils, LDN and detoxing help me. Vit D3 5000IU, zinc 50mg if detoxing, fish oil 2000mg, 20000mg of evening primrose oil. 2000 mg of lecithin, Phosphatidylserine/DMAE or krill oil, Coenzyme Q10, Rhodiola, Mg citrate 400mg, Vit C, 5000mcg of biotin, Nature’s Plus- Source of life multiple, HCl and enzymes with meals, dairy free probiotic, Vit B12 methylcobalamin shot/spray/under the tongue kind/intrinsic factor kind, MTHF folate, coenyzme Q10, rhodiola, may help brain/body/thyroid/ and more health issues. Gluten is wheat/barley/rye..oats may act like gluten with avenin. GMO corn/soy/canola oil may hurt. Amour thyroid maybe needed since gluten may made antibodies to the thyroid. Sunlight (helps the immune system and helps to heal the gut lining),exercise, organic food, good water..not tap water, cooking by scratch pure food….. no food in a box/bag/premade/label/restaurant which may help avoid hidden gluten. Certified gluten free food may have 20ppm of gluten…too much. Nuts not sold in the shell/meat basting/some spices may have hidden gluten and lotion/make up etc. One restaurant cooks special for me…rice/veg/tea/extra mushrooms (no meat since the woks may have MSG/gluten in them). EDTA/DMPS IV chelations from an Alternative doctor, 600mg of cilantro, zeolites, organic sulfur, Now brand- Detox support, Far Infrared Sauna and more may help detox. Hair tests show good minerals and heavy metals. Heavy metals can block thyroid and other chemical reactions in the body/brain. LDN may help block hidden gluten/heal the gut lining and help the immune system, but the Celiac diet is still needed. 100% no gluten..no hidden or microscopic gluten may help. Cutting back on gluten or cheating by eating gluten hurts the immune system. It may take 1 1/2 months to heal the gut lining after getting hidden gluten. Amour thyroid has some T3 and Calcitonin. Synthroid is only T4..may not convert to T3. Zn/Se/enough iron/strong probiotic may help convert T4 to T3 for thyroid. Tests may not work to diagnose Celiac. Best wishes. I think I just found out why all the things I tried did not work for me. I still have Hashimotos and hormonal imbalance, because of an overload of copper! I found out through a hair mineral analysis. I also have HPU, where the body looses too much zinc and B6 and manganese. I did not take enough of these, therefore my body stored too much copper and I have copper toxicity now. With too much copper the thyroid does not work properly and it also influences my adrenal fatigue and my hormones. Maybe this information might be helpful for other people! Tina – thank you for following this page and for sharing. Not everyone will need every single supplement! In fact, I believe that most nutrients should come from the diet, this is why I always list food sources for most of the nutrients, vitamins, minerals and probiotics that are depleted in Hashimoto’s in the book and on the blog. However, some may require/prefer supplements and the supplements on the website are a resource for those that do. I recommend getting tested for deficiencies to determine your need for a supplement as instructed in the book and blog. I also don’t recommend starting multiple supplements all at once. I recommend starting one at a time and then adding another a week or so later once it has been confirmed that the first supplement is not causing any harm. I do have a full supplements chapter in my book. Have you checked it out? Hi! I just read your Hashimoto’s Protocol book. I have a few questions: 1.) I can’t seem to find the omega-3 fatty acids supplement you recommended in the book. 2.) I saw in the above comments that we may not need to take all the supplements…does this apply to the ones you recommend in your 2nd book? 3.) In your second book, for each protocol do I stop the previous protocol’s supplements? Like for the liver protocol, do I stop taking those after the 2 weeks and move to the adrenal protocol? 4.) After the 90 days…what do I do next as far as diet/supplements? Thank you so much for your wealth of information. I’m excited to try your protocols and feel better! Kerry – thank you for following this page and for your support. 🙂 Please, contact info@thyroidpharmacist.com where my team is standing by to assist. Melissa – thank you so much for sharing your friends journey! <3 That is so good to hear. What a great friend you are!